Huber Engineered Materials is pleased to announce we’ve recently acquired the Safire™ nitrogen and phosphorus halogen-free fire retardant technology from Floridienne Group and Catena Additives (a 100% subsidiary of Floridienne). Our goal is to take the patented Safire™ technology, integrate it within our existing halogen-free portfolio of flame retardants and smoke suppressants, and rapidly develop a line of commercial products. The Safire™ technology is a nice fit that we believe will complement perfectly our current broad line-up of high-performing alumina trihydrate (ATH) and magnesium hydroxide (MDH) grades and engineered molybdate compounds. We soon will be sharing additional information as we keep you up-to-date with the integration of the Safire™ technology within Huber, which marks the third major acquisition over the past five years for Huber’s growing fire retardant additives business. It follows the 2012 purchase of the specialty hydrate flame retardant business from Almatis and the 2010 acquisition of the Kemgard® flame retardant and smoke suppressant business from Sherwin-Williams. 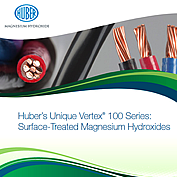 Huber Engineered Materials is pleased to share a new piece of literature showcasing our Vertex® 100 SP and Vertex® 100 SV magnesium hydroxides. Both of these high-performing products offer an outstanding balance of fire retardance and smoke suppression with outstanding mechanical properties for wire and cable jacketing. Click below to learn more, and we invite you to contact us for product samples.